Sweetly B Squared: Fun, Fun, Fun!! Saturday, August 17 starting at 5PM. 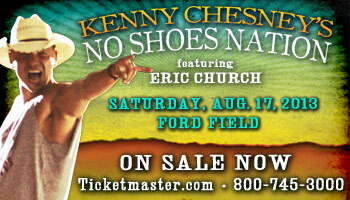 It's at Ford Field (Detroit) and has a bunch of fun country artists. What's your favorite song by Kenny Chesney? He's definitely no new-kid in town, so there's lots to choose from. I hear he does an excellent show - I'm excited to see and hear it! I'd love to go.... Too bad I chose this year to retire and travel - like all of the time :( Okay, I like it but I miss doing fun stuff you with.